Several months ago while surfing for some free printable canning labels, I found Graphic Garden. 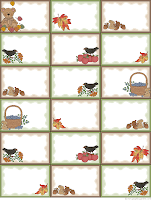 The designer has some delightful graphics for sale, but she graciously offers many free printables: stationery, note papers, greeting cards, envelopes, lists, calendars, scrapbook tags, school awards, bookmarks, recipe cards, labels, and coloring patterns. The links are given on the left-hand side of the home page. 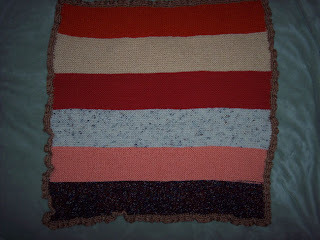 Lately, the Oddball blankets I've knit have had food themes: this is Strawberry Shortcake. 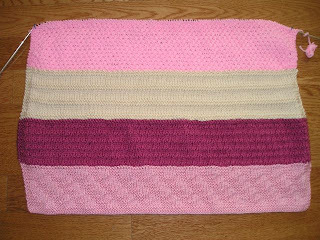 It was fun to work near the end of a blanket for a change, as I am normally the second knitter. The yarn came from my stash (I don't know where I got it because I don't buy pink yarn), and I used the Moss Stitch. I didn't realize this stitch pattern had two versions: British and American. 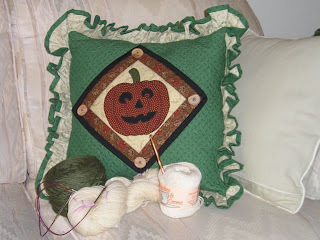 I used the American version that was in my Leisure Arts book, 99 Knit Stitches. As my thoughts begin to turn toward Fall and my taste buds yearn for treats from the oven, a new West Coast Oddball Baby Blanket, named Pumpkin Pie arrived in my mail box. 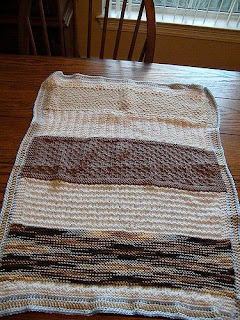 Shandeh started the blanket in North Carolina with a dark chocolate brown with flecks of orange, turquoise, yellow, green, and white. The yarn that I originally selected for this blanket did not coordinate or even complement the brown, so I selected a cross between a muted orange and peach. 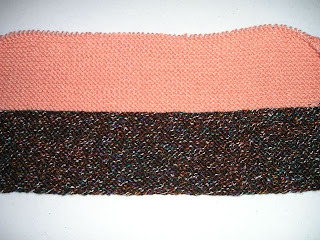 Shandeh knit the beginning section in a garter stitch, and I continued using it for my section. The West Coast Oddball Knitters have finished several blankets already. You can check the group's progress here. Outside My Window. . .the thermometer says 20 degrees Fahrenheit. The grass, covered with a layer of frost, glistens in the sun's rays just clearing the row of houses to the east. I am thinking... about being lazy today. 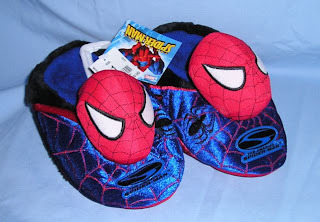 I don't have a volunteer shift this morning, so I may just linger in my PJs for a while. I am thankful... that the weather and roads were good on Friday and Saturday. A friend and I drove to Evanston and manned a pulmonary hypertension table at the health fair. The eight-hour round trip was long and tiring, yet we were able to connect with another PH patient and an interested doctor. I consider those two contacts worth the trouble and expense of the trip. Slowly and one community at a time, we are educating the public about pulmonary hypertension. In the kitchen... the laundry is sorted and ready to be placed in the washer. I am wearing... my flannel PJs, wool socks, and a tattered robe. I am creating... the twined rug for my sister (I am not making any progress), a crochet dish cloth from my beginning crochet class, the two-color Christmas stocking from another class, and a pair of socks that have been on the needles for over a month. I am going... to stay close to home this week, as the weekend trip wiped me out. I am reading... nothing at the moment. I need to go to the library. I am hoping... to actually do some knitting and twining this week. My projects have been on the back burner for too long. I am hearing... the hum of the refrigerator and the clock chiming the half hour. One of my favorite things... a rock that I found when I was a teenager. It is about the size of the tip of my index finger, but what makes the agate unique is the image of a bird flying toward a crescent moon. I should have it made into a necklace pendant, but instead it is tucked inside a glass, milkware hen in the china closet. A Few Plans For The Rest Of The Week: a) rest, b) attend an open house for a new elementary school, c) get a haircut. Don't overlook the people who worked hard to help you have a successful launch. Nothing is every accomplished without the efforts and support of those not in the limelight. Make an effort today and thank someone who helped you with a project. I enrolled in a continuing education class (two-color knitting), but I was the only student. The instructor, a Tuesday night knitting group regular, is going to teach me on Tuesday nights. This week I began my project - a two-color Christmas stocking. Learning to knit Continental is proving to be a big challenge. It is so different to pick the yarn rather than throw the yarn, which is what I do with the right hand. Yet, this old dog is slowly learning a "new" trick. Errors and all, I like the way the stocking is turning out. 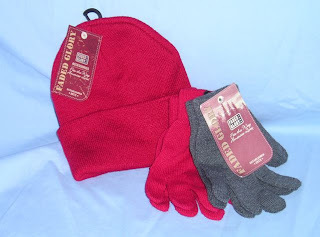 I decided to purchase these items, but I could just as easily knit them. 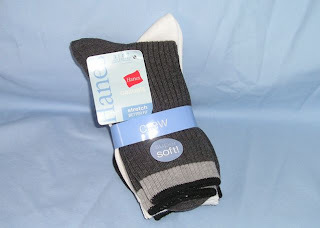 Add other items to personalize the gift. Miscellaneous personal hygiene products, word puzzles, coloring books, healthy snakcs (low sugar), etc. 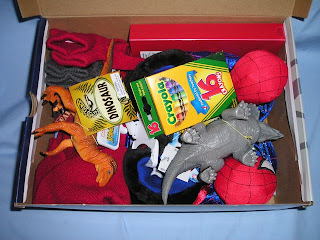 Put the items in a shoe box, mark the outside with the size of the slippers and the gender Bring the box and items back to the church for the Youth to wrap and distribute to the Wind River Lutheran Mission. The coordinator said the church will add a book of the Christmas Story since the boxes will be going mostly to those without a church home. 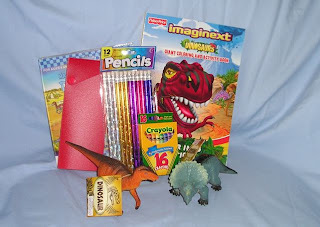 These simple items in a box may be the only gift this child receives this Christmas. Outside My Window. . . the darkness is thick and cold. I can hear the neighbor's car idling and car doors slamming, yet I can see nothing. I am thinking... about the up-coming election. This election will definitely affect the future of America. I pray that every voter casts a ballot based not on party or personalities but on research and qualifications. I am thankful... that the "bug" I had last week has finally run its course. In the kitchen... the dishwasher has finished its cycle and needs emptying. I am wearing... a blue and black dress. I am creating... a twined rug that my sister requested for Christmas. I didn't do much work on it this past week. I am going... to cast-on a cardigan sweater for my great-niece's American Girl Doll. She requested one for Christmas. 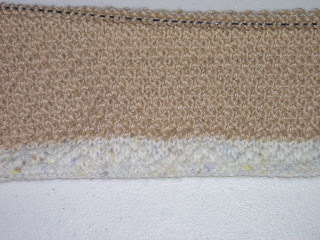 I am hoping... to finish the twined rug this week and to start a sweater for my great-niece's American Girl doll. I am hearing... country music from the clock radio in my bedroom. Often, it does not wake me. Sub-consciously, I hear the music, and I am lulled back to sleep. The radio plays for two hours and then shuts itself off. One of my favorite things... my computer and the internet. I love to research topics that pop into my mind. The internet gives me access to the largest library imaginable. A Few Plans For The Rest Of The Week: a) meet with PH support group co-leader and prepare display boards for November, b) lunch with two friends, c) prepare PH items for weekend health fair booth. Sisters are friends that God picks for us. He did a wonderful job picking my two sisters: Evelyn is my oldest (10 years older) sister, and Marilyn is 8 years older than me. Even though we live hundreds of miles apart, we manage to get together at least once a year. Both Evelyn (everyone in the family calls her Sis) and Marilyn love to quilt. I dabble at quilting because it gives me something to share with them, but I prefer knitting. This panel was rescued from a thrift shop about a month ago. 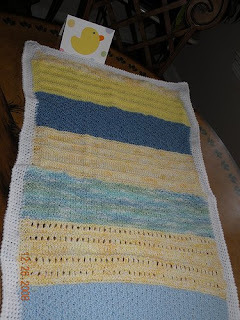 I am sure someone purchased the panel, intending to make it into a baby blanket, but the project was never finished. I bought the panel for a quarter, and yesterday added a binding from my fabric stash. 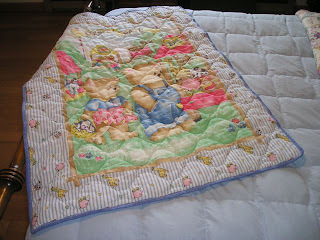 The blanket is now ready to provide some quilted comfort for a child. Temperatures have been more seasonal this week, and thankfully, last weekend's snow is nearly gone. 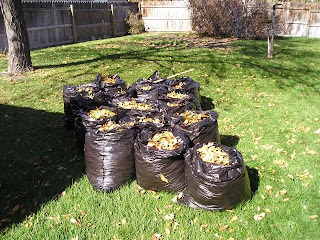 Like it or not, it was time to start getting the leaves off of the lawn, and the only way to do that was to rake and bag them. They were so water-logged that mowing them up was not an option. The guy who does my yard didn't think he would have time to do it this week, and with another storm predicted next week, I took on the mission. I know that I had no business doing this, but I raked for ten minutes or less and took a rest. Bit by bit, I was able to get the leaves in the front yard bagged on Wednesday afternoon and Thursday morning. Thursday afternoon, I started on the back yard. I borrowed the neighbor's wheel barrow to haul the bags to the driveway for pick-up by the city. When I called to schedule the pick-up, I was told the city was no longer doing that. Hmmm, nice that they tell people about the change. I called the yard guy to see if he could stop by and take the bags. He showed up almost immediately. I didn't even have time to take a photo of the pile of bags, twenty-six in all. The yard still has some renegade leaves that refused to be bagged, but I am happy that the bulk of the leaves are off of the lawn. The renegades will have to wait until spring clean-up. I picked up a bug somewhere, and it has hit me hard. It started on Saturday with extreme fatigue and then a sore throat. On Sunday, the headaches and dizziness began. I have been trying to get more rest, drinking hot tea, and staying close to home, but none of it seems to be making a difference. I may get a throat swab tomorrow to see if I have strep. 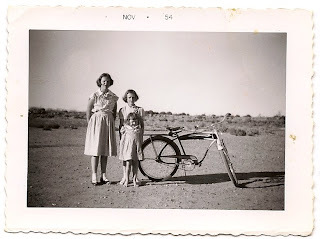 I haven't felt like doing much of anything - no knitting, no twining, no reading. I feel like a complete couch potato. Outside My Window. . . is a blanket of white: all the lawns are covered with the six or seven inches of water-laden snow that fell over the weekend. Scattered on top of the snow are newly-fallen leaves, and encased under the snow are leaves that fell before the storm. Now, I wonder if I will be able to get them off of the yard before spring. 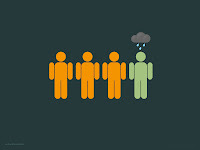 I am thinking... about the attitudes of Americans toward the economy. It bothers me that those interviewed for the evening news are bemoaning the buy-out and complaining that the government should buy-out their credit card debt, too. I would be willing to bet that a majority of those individuals do not have a budget and make a lot of impulsive purchases. They probably buy brand-named merchandise for the status it gives them. I happened to catch a Dr. Phil show last week on this topic. I was appalled at the story of one couple who had filed for bankruptcy twice and had plunged back into the same behavior again and had over $50,000 in bills. They were worried about "appearing poor" so they bought items they had not even opened or used. The wife made purchases and hid them from her husband; when he found them, he went on a shopping spree, too. They showered their only son with toys and gadgets that he didn't play with or want. Dr. Phil told the couple that by amassing such a debt and expecting others to bail them out they were stealing from everyone. I don't think the couple got it. Sadly, I don't think most people get it. Wall Street and corporate America are not the only ones responsible for this collapse. The reality is that everyone is going to have to tighten their belts. It is going to take a long, long time to pull back from the brink. I hope that Americans have the patience, the maturity, and the self-discipline to do it. I am thankful... I didn't make my weekend road trip. I didn't want to fight the weather. In the kitchen... the tomatoes are beginning to ripen. I have enjoyed at least one every day since my friend brought them to me. I am creating... a twined rug that my sister requested for Christmas. I am going... to my crochet class tonight. I feel good about what I accomplished at last week's class: chaining, single and double crochet. 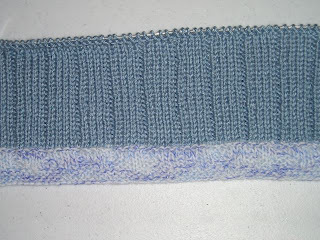 I am still slow, but I have made a dishcloth. I am reading...The Kite Runner by Khaled Hosseini. I finished it yesterday. Even though some of it was upsetting and difficult to hear, I was eager to discover what happened next. I learned a lot about Afghanistan and its history. It motivated me to do more knitting for the children of this war-torn country. I am hearing... the banner outside my door flap in the wind. Hopefully, a warm wind will come through this week and melt the snow. One of my favorite things... is driving in the country on a warm summer night with the windows down to enjoy the smells and sound of the fields: sweet alfalfa and clover, rustling corn leaves, running irrigation ditches, moist dirt. I am a country girl at heart. A Few Plans For The Rest Of The Week: crochet class on Monday evening, conference call on Tuesday, knitting class on Thursday. If Columbus had turned back, no one could have blamed him, but no one would have remembered him. Sometimes we have to be bold and just try something new, dangerous, and maybe even impossible, in order to succeed. There are no reliable portraits of Columbus from his lifetime. 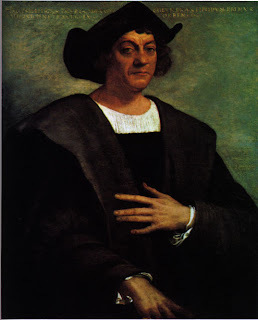 This one was painted by Sebastiano del Piombo shortly after Columbus's death in 1506. Metropolitan Museum of Art. Reproduced from Alistair Cooke, Alistair Cooke's America (New York: Alfred A Knopf, 1973), p. 27. Look what Mother Nature sent to Wyoming? Winter Storm Warning here with an expected 6 - 12 inches by the end of the weekend. Presently, it is 25 degree Fahrenheit: anticipated high 27 degrees. A pot of Wild Rice soup is simmering, and the ingredients for cornbread are waiting. 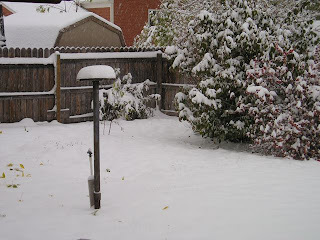 I am hunkering down and plan to get some knitting and rug twining done while the snow continues to fall. The storm dropped a total of 10 inches of snow in town. 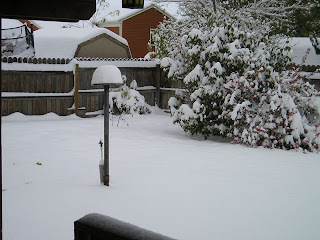 Lander reported 26 - 29 inches and Thermopolis' total was 15 inches. The moisture was welcome but not all at once: crops are still in the field, many trees were damaged, and some motorists were hurt or killed in accidents. 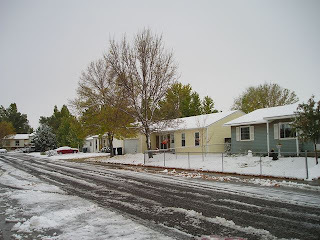 This storm gave everyone a wake-up call that winter is just around the corner. Lion Brand just revealed four new desktop images. Find one you like and download it for your desktop or screen saver. of brown, yellow, and green monogramed leaves. I intended to make another sweater for the afghans for Afghans youth campaign, but I didn't think I would have enough time to finish it. When I saw Reed's finished projects, I decided to make a vest instead of a sweater. Outside My Window. . . the sky is clear, and it promises to be a beautiful day. The air is crisp and a bit brisk. Puddles remain in the gutter from last night's rain. Wet leaves, as if glued in place, do not stir in the light breeze. I am thinking... about my brother-in-law who had back surgery last week. Since he is such a workaholic, I wonder how my sister is going to keep him occupied while he recovers. I am thankful... that it was rain that fell last night. The weatherman said it might snow, but I am not mentally ready for winter. I want to fall colors to last for a bit longer; I need a gradual transition this year. In the kitchen... is a box of tomatoes that a friend gave me. He apologized that they were small and not ripe. They are the perfect size for snacking, and they will ripen in their own good time, allowing me to enjoy them longer. No grocery store tomato can match one from the garden. Garden tomatoes have the scent of the plant, nothing can compare. I am wearing... black slacks and a pink sweater. I am creating... a wool sweater. 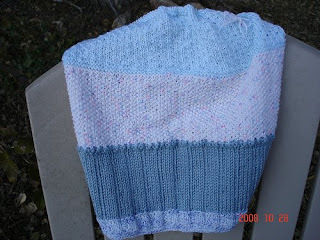 I hope to finish it by Wednesday and get it in the mail for the afghans for Afghans youth campaign. If I do not finish it in time, it will be sent to the Pine Ridge Reservation. Either way, a child will be kept warm. I am going... on a road trip this weekend. I am reading...The Kite Runner by Khaled Hosseini. Actually, I am listening to the book on CD's while I knit. I am on disk #7. I didn't have a chance to listen this past week. I am hoping... to get a rug started this week. I have been procrastinating too long. I am hearing... the hiss of the tea kettle. Perhaps, I will have one more cup of tea before getting serious about my day. One of my favorite things... is a china cabinet that I inherited from my mother, who inherited it from my grandmother. Standing about five feet tall, it has curved glass panels on the side and a glass door in the center. On the four shelves, I have a mixture of old and new glassware and china. I vividly remember the day my mother received the cabinet. Her brother and his two children from South Dakota hauled it to Wyoming in the back of a pickup in the dead of winter. It was bitter cold, and mom was afraid that the cabinet's glass would crack as it warmed up in the house. Since I obtained the cabinet, it has been moved twice: each time I hold my breath, fearing the worst. A Few Plans For The Rest Of The Week: luncheon meeting with a new support group member, work on support group newsletter, road trip this weekend. 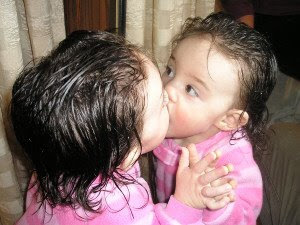 My great-niece constantly reminds me not to lose the child-like wonder of the world. West Coast Oddball Knitters are beginning more blankets, and I was privileged to work on three of them this week. I don't understand why the coordinator cast on and knit only an inch on each blanket because each knitter's section is usually 4 inches. Perhaps, she plans to match the beginning and end of these blankets. All three are going to be preemie blankets. This is Lemonade Stand. 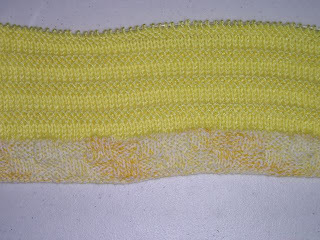 I used Simply Soft's Soft Yellow and knit a garter rib. 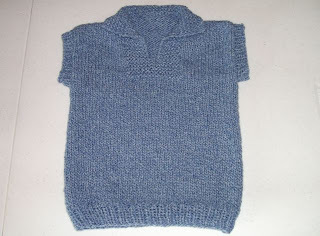 Little Boy Blue was knit with Simply Soft's Light Country Blue in a 4 X 1 rib. Puppy Love was knit with Simply Soft's Sand in a Dot Stitch. October will be a month of challenges: I am taking two craft classes, organized by the Central Wyoming Community College Community Outreach Center. Hopefully, I will learn how to crochet and how to do two-color, two-handed knitting. I have tried to crochet before, but this time, I have enrolled in an actual class. It will meet three evenings this month, and the instructor promises that I will learn how to make a simple dishcloth and develop skills to crochet simple shawls and afghans. She is accepting students from ages 8+. Hopefully, I will not embarrass myself. 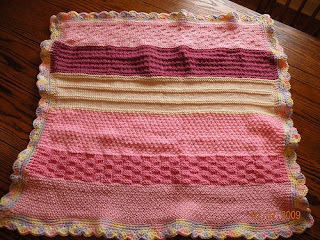 I want to learn to crochet so I can add some borders on the Oddball Baby Blankets, but I will be happy to complete a "simple dishcloth." My second class will be just as challenging even though I have been knitting for years. 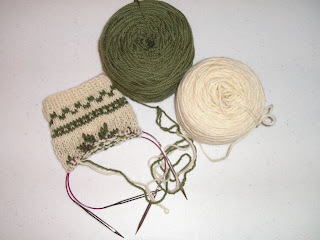 I've never knit with yarn in both hands, and the Christmas stocking project will be knit in the round with two colors. I am using yarn reclaimed from wool sweaters for the stocking. 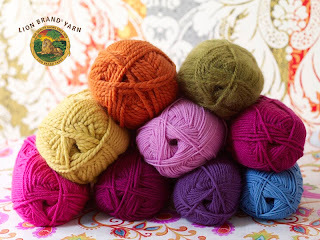 In the past, I have knit with two/three colors, but I always dropped the yarn and picked it up again. 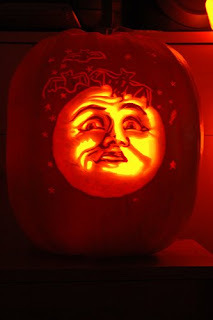 These challenging classes and projects will occupy much of my time in October. This morning, I spent some time and backed-up my computer files. I try to do that every three or four months, but I it had been nearly six months since my last back-up. If you haven't backed-up your files lately, I would strongly advise it. All it takes is one major power surge to wipe out your computer. Trust me, it happens. Knowing you have your files safely copied is worth the minimal cost of the CDs. After I organized my files, I ran a program to defragment my computer. I have learned that by doing this periodically, it does not take as long. If I delay it for six months or longer, it can take hours to defrag the hard drive. Yielding some time and effort to copy files, to organize, and to defrag may not prevent a future disaster, but it will prevent me from losing files and having to reenter a lot of information. 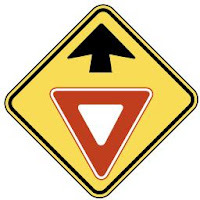 I prefer to Yield now rather than coming to a Stop later.